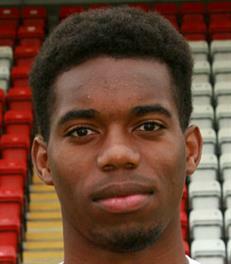 Andre Brown joined the Harriers on the same day as Sam Austin. Starting his career with Crewe Alexandra when he was ten years old he was something of a footballing prodigy but as with such kids he failed to make the grade and was released at the end of the 2015-16 season. He has spent time on loan at Leek and Rushall Olympic but it was while on loan at Worcester City that he caught the eye of the Harriers assistant manager Matt Gardiner who bought him to Aggborough. While on loan at Rushall he scored five goals on his debut against Stratford Town. The game ending with his side winning 11-0. After two seasons with the Harriers, and twenty three goals, he turned down a new contract to join other Harriers players heading for AFC Telford Utd.